Traffic police have asked drivers to drive with care as large military vehicles ply Israel's roads. Gaza Op is not over, say leaders. Traffic police have asked drivers to be aware of the possibility that they will be sharing the roads with large numbers of army vehicles. The vehicles, including tanks, APCs, jeeps, and others are being transported on wide-bodied military transport vehicles. The vehicles are generally wider than a standard lane on a highway, and drivers were asked to take extreme care in order to avoid accidents. 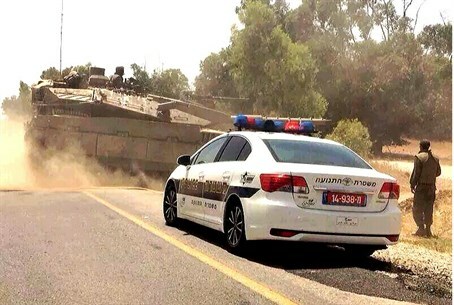 With the IDF winding down its presence in Gaza, many of the military vehicles that have been drummed into active duty over the past several weeks are being taken back to their original bases. Drivers on Road 6, the Cross Israel Highway, were asked to take special caution, because drivers on that road generally drive at high speeds. The official speed limit for most of Road 6 is 110 kilometers per hour, but faster speeds are common. Because of the high speeds, accidents on Road 6 tend to be more severe than on other roads. Cutting speed is one sure way to avoid accidents, traffic officials said. “We call on drivers to avoid stopping on the side of roads, and to take extra caution, to concentrate on the road, and to pay full attention to what they are doing. The vehicles in question are wider than those drivers are used to, and vehicles that slow down significantly when they go uphill. Drivers are asked to be patient,” the Road Safety Administration said in a statement. Prime Minister Binyamin Netanyahu also said Monday that the operation is continuing. “What is about to conclude is the IDF action to deal with the tunnels but this operation will end only when quiet and security are restored to the citizens of Israel for a lengthy period," he explained.